Please forgive me for the unseasonal timing of this post but there was no way I could wait until next Christmas to share this craft. 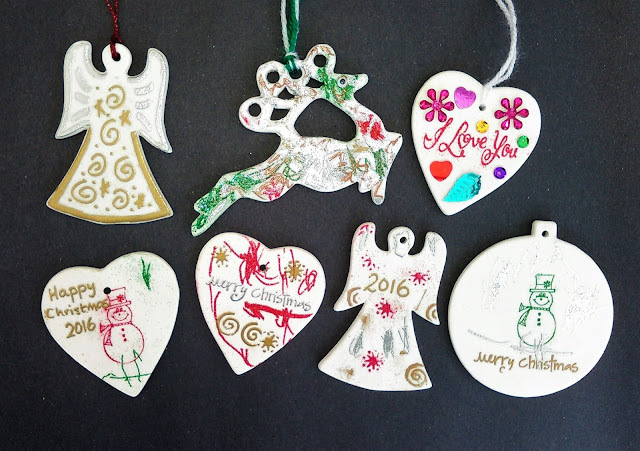 I bought lots of ceramic decorations from Hobbycraft last Christmas and decided to try out something that we'd never done before. I have an embossing pen and ink pad that Jessica and I used to emboss onto the ceramics. It was brilliant. Jess loved tipping the powders over the ink and shaking them off as well as watching the magic of the melting under the heat gun. We did them all one colour at a time and were careful to have a large cork mat underneath because the ceramics get incredibly hot. These looked beautiful on the tree. I was particularly tickled by Jessica's insistence that the snowmen all needed legs and I absolutely love her reindeer. That was my favourite decoration last year I think.